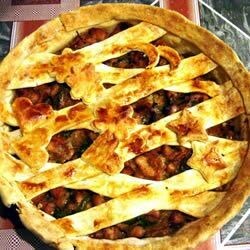 "A yummy savory pie I came up with a few years back." Cut chicken into bite-size chunks, and marinate in soy sauce. In a lightly oiled saucepan, saute onion and garlic over medium-high heat until onion in soft but not brown. Add chicken pieces, and saute until chicken is cooked through. Stir in chicken broth, carrots, honey, mustard, parsley, salt and pepper. Mix cornstarch with a few tablespoons of water to make a paste. Bring chicken mixture to a boil, and stir in cornstarch mixture. Cook, stirring constantly, until thick. Mixture should get pretty thick: add more cornstarch mixture if necessary. Pour chicken mixture into pie shell. Top with crust, cutting small slits in top to let steam escape. Bake at 425 degrees F (220 degrees C) for 15 minutes. Reduce heat to 350 degrees F (175 degrees C). Bake 30 minutes more, or until crust is golden brown. See how to make a great marinade and basting sauce for grilled chicken. I added frozen green beans and potatoes which I think were necessary otherwise there wouldn't have been enough to the filling. Unfortunately I left out the soy sauce and it turned out too sweet.